most instances barring leakage or unusual site constraints. Sterling will obtain a permit from the NJDEP if the tank is regulated (see the chart below for applicability). Once the state permit is received, or if the tank is not regulated, a local permit will be obtained. A mark out for utility lines will then be requested by Sterling. Upon mobilization the remaining product and sludge is pumped out of the tank and transported to a recycling or disposal facility. The tank is then excavated. If the tank is being filled in place the digging will normally be performed by hand. 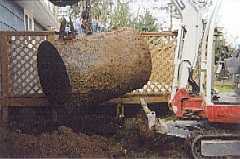 If the tank is going to be removed, a backhoe or excavator will perform this work. A manway will then be cut in to the tank to allow entry. At this point, a member of our field crew will get into personal protective clothing including a respirator. The tank is then physically entered, scraped down, vacuumed out, and wiped to inert steel. After the tank is cleaned out, the excavator will remove the tank from the excavation in the instance of a removal. A township inspector will then inspect the tank to confirm proper cleaning. Sterling will then dispose of the tank at an approved recycling facility. The excavation will then be filled with certified clean fill material. If the tank is being decommissioned in place the tank will be filled with sand or stone and the excavation will be filled in after the required inspections. Sterling also performs Above-ground Storage Tank (AST) removals. At Sterling, we do everything possible to minimize site disturbances, however, there is always some site restoration to be done. Sterling provides complete site restoration, from paving to concrete work to landscaping. Interested to know how much these services cost? Go to our create your own estimate section to get an idea of the costs for your project. 6000 Gal. UST being removed.